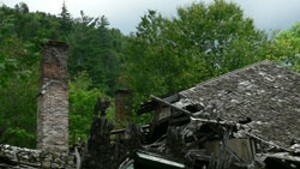 7/22/10: Take a walk back in time in the abandoned ghost town of Tahawus, New York. In the 1800s, Tahawus was an active mining village thanks to its rich deposits of iron ore. Years later it became home to the swanky Tahawus Club. In the mid 1900s mining operations were resumed thanks to the nation's need for titanium dioxide in WWII. Now this ghostly town in the desolate wilderness is in ruins and its new owners, the Open Space Institute, hope to preserve and conserve this historic stretch of land for generations to come. Music: Carrigan, Young Men Never Die, "Theodore," "Moving Bones"